Info "Climb the ice! Snag the eggplant!" Ice Climbers (known as Ice Climber in the European version) is one of 9-Volt's microgames in WarioWare: D.I.Y. 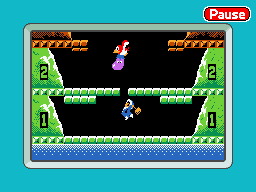 This microgame is based on the video game Ice Climber. To win the game, players has to make Popo jump, and destroy the blocks above him and then grab the eggplant. To do so, they have to tap anywhere on the stage to make him jump and break the blocks. After a gap has been made, the player needs to jump again and take the eggplant from the Nitpicker. If time runs out and the player does not manage to get the eggplant, they lose the microgame. The jumping and item sound effects are replaced by sound effects similar to the ones from Super Mario Bros. when Mario jumps, and Donkey Kong when Mario collects an item, respectively. This page was last edited on December 22, 2017, at 18:46.